My Social Venture “Global Oral Health Foundation Society” is with a mission to provide for “Oral Healthcare for all”. The Cause of Undertaking Oral Health programmes for the poor and the underprivileged living in the rural countryside is to provide for effective maintenance of good oral health and hygiene by way of subsidised treatment of dental ailments among the people irrespective of cultural or religious diversity. After all, we must not forget that 74% of India resides in its Villages. I had in this mission, conceptualised and set up the Dental Department at Shri Nabh Kanwal Raja Sahib Charitable Hospital at Village Mazara Nau-Abad in Nawanshahr-Punjab in the year 2007. This Dental Department went on to provide Dental Healthcare Treatment to the people living in the village and also to the surrounding villages at highly subsidised costs. It revolutionized Oral Healthcare among the rural areas in approximately around a belt of 150 Villages. Many patients had come for their First visit to a Dentist such was the neglect about their Oral Health. This translates into the lack of knowledge about Oral Health and Hygiene in the rural populations. Much more such Initiatives are needed for the spread of awareness of Oral Health by the opening up of Dental Centres across the Villages in Rural India. 50% of the Female patients were from 20-40 years age group. 70% of the Male patients were below 40 years. 50% of all the patients examined ( male & female both) had poor Oral Hygiene. They were advised Oral Prophylaxis ( professional cleaning of teeth by a Dentist/ Dental Hygienist). A majority of the children over 40% under the 20 yrs age group had one or more carious teeth. This was because of the lack of good oral hygiene habits among children and the large consumption of sweets ( sucrose ) by the children. I have seen from close quarters while working as a Consultant and Head In-Charge of the Dental Department with a Charitable Hospital situated in the rural hinterland, the day to day hardships borne by the poor and the marginalized sections of people in receiving quality dental care at the hands of the Dental Professionals. The most accessible and Principal healthcare provision facilities for rural India, Primary Health Centers (PHC)do not provide Dental Services and only 20-25% of Community Health Centers, the point of secondary healthcare for rural villages within the Indian Healthcare System, provide Dental Care. In Rural India, the dentist to population ratio is as high as 1 Dentist for every 250,000 residents whereas in Urban India the ratio is I Dentist per 10,000 population. This vast striking imbalance seen of the Dental Professionals not working in the rural areas acts as a major barrier for the rural people to access quality dental care. Another major factor that acts as a Barrier is the high cost of dental treatment. The poor and underprivileged sections of people in the rural areas thus cannot access the Private Dental Clinics in the nearby towns because of the high costs involved. Thus they are left with no option but to avail the services of the Quacks (Unqualified Professionals) because of the low costs. 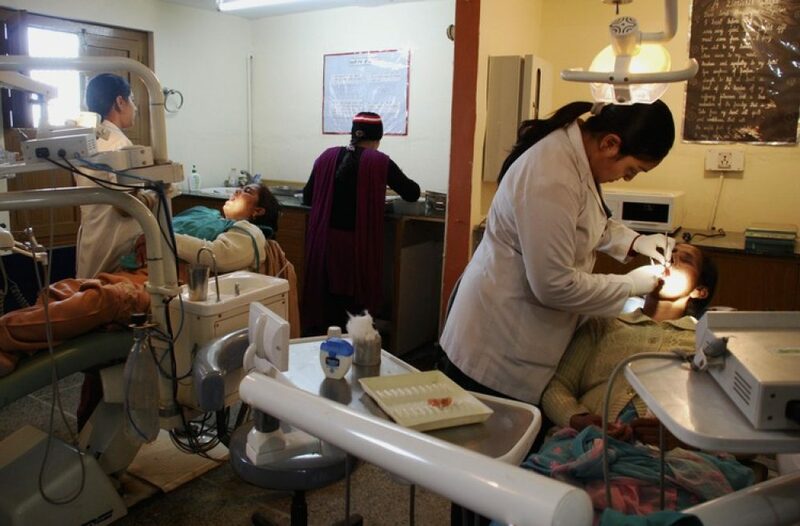 There are about 100,000 Quacks who are providing crude dental care in the rural parts of India. Thus the villagers often end up with serious consequences to their Oral Health at the hands of these Quacks. It is to this section of society that I would like to target and bring back smiles on their faces. Official Facebook page of the NGO: https://www.facebook.com/gohfs.